I quite enjoyed Archimedes and the Scientific Method by Tom Holt. Archimedes (yes, the famous Greek mathematician and scientist) is asked by the King Hiero, his cousin, to find out what happened to the Roman diplomatic attache. Well, they know what happened to him, but they want to know how or why. Too bad no one thinks too highly of the Romans. I’ve known Romans who can speak Greek so well you wouldn’t know they weren’t born here; not, that is, unless you listen to what they actually say. This was a fun story. Something to do with Diana is a Steven Saylor story featuring Gordianus and his mentor Zoticus. This time we hand out with some Romans, and they seem to have a better opinion of Greeks than the Greeks have f them. (See previous story.) I read and enjoyed another story about them, so I have no idea why I haven’t read one of his books before. It takes a bit before we get to the murder and the mystery, but I rather enjoy the tour, so I didn’t mind. The Temple of Artemis is one of the world’s great storehouses of wealth–and every Roman governor spends his tenure trying to figure out some way to get his hands on it. And the Lord wasn’t likely to give much assistance to someone who’d just eaten his eyes. And continues along just as strangely. Though it did make several interesting points. “What can such a young man as your self know about pain, to capture it so perfectly?” He stared fondly at the image. …I wondered what a man with as much wealth as Florentius could know about pain to appreciate it so much, but I only smiled modestly. I wondered whether it was a story about insanity more than murder. Not my favorite story. Night of the Snow Wolf by Peter Tremayne is a Sister Fidelma mystery, and it reminded me how much I enjoyed those stories, so why haven’t I read one in years? Jettisoned by Deirdre Counihan is set in the Bronze age, and a confusing but interesting story. The main character is a girl whose parents died when she was an infant, and who was raised by her aunt. There are lots of secrets, but I’m not sure they were what confused me as much as the time / world initially confused me. I did eventually figure things out, but it was slow going initially. A Fiery Death by Ian Morson is a mystery set in Venice, and features an older man who likes to tell stories of his glorious past. It’s also set in a time where Venice was in poor graces with the pope, and shows how much power the Catholic church had at that time, that they could break all trade agreements with an entire city. Hide and Seek by Tony Pollard is set immediately after Guy Fawkes Gunpowder Plot, when the Catholic conspirators were in hiding. I quite enjoyed the bit about the priest’s holes. The Fourth Quadrant by Dorothy Lumley features Ada Lovelace and Charles Babbage. Do I really need to say anything more? Brodie and the Regrettable Incident by Anne Perry was… okay. I think that’s all I really have to say about it. Forty Morgan Silver Dollars by Maan Meyers was extremely confusing, as it had many different characters experiencing the events in different ways. It all came together eventually, but it took a bit before I could keep track of everyone and what they were doing. “PINKYS on Delancy,” Dutch told the hackney man. I really, really hope that was a deliberate reference. Trafalgar by Charles Todd is an Ina Rutledge. Although I prefer the Bess Crawford stories, that doesn’t mean I don’t like the Inspector Rutledge stories. This story starts with an old dog, found dead in the cold. Dead of Winter by Richard A. Lupoff is set in the US during the lead up to WWII, and the activities of members of the American Nazi party. This story was also all over the place, but it was interesting, in its way. 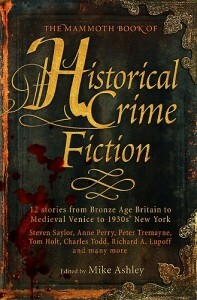 It was an enjoyable anthology, reminding me of several authors I need to read, as well as re-read.